Sketching of General George Weedon who was initiated, passed, and raised to the Sublime Degree of Master Mason at Kilwinning Port Royal Crosse. Kilwinning Crosse’s history is studded with dozens of local and national figures. The astonishing thing about masonic education is it’s ability to make the brethren feel very, very small. It is only when we recognize the massive scale of our fraternity that we realize how important a job the current brethren have been given to carry on the heritage of our organization. Below are several notable brethren who have been a part of Kilwinning Crosse over it’s 250 year history. The completion of this list is an ongoing research effort currently underway by the lodge. Check back for updates! General George Weedon – Brother Weedon was made a Mason on May 3, 1757. As a brother, he would serve the lodge until 1767 when his business and occupation would make membership at Fredericksburg No. 4 more convenient. There, he served as Worshipful Master. 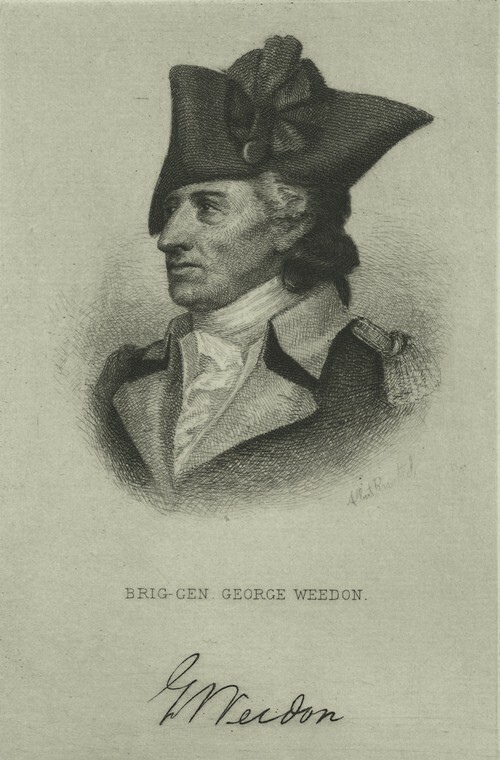 During the Revolutionary War, General Weedon would serve a significant role in repelling General Cornwallis and delaying the British retreat in enough time for the French Fleet to effectively block any escape to the sea. If it had not been to the actions in battle of General Weedon, the British might have escaped and the war could have continued for some time after¹. President James Monroe – James Monroe is said to have been a member of Kilwinning Crosse and is known to have paid dues to the Grand Lodge through 1780². The Taliferro Family – The Taliferro family is one that has played a crucial role in the formation of Freemasonry in the New World. John Walker Taliferro is recorded as one of the first initiates of Kilwinning Crosse in April of 1755. Many in this family were responsible for the establishment of many localities, including “Hoy” Taliferro who was a brother of Kilwinning Crosse and a settler in King George County¹. Dr. James Bankhead – Dr. James Bankhead was a Scottish immigrant who served in the Revolutionary War as a naval officer and married to Ellinor Monroe of Monroe’s Creek, said to be aunt to President James Monroe¹,³. His son, General James Bankhead, went on to serve President Monroe as attaché and US envoy to France and England. Robert O. Peatross – Of interest to the brethren within the 8th Masonic District (the district composing Kilwinning Crosse and those lodges inclusive of Ashland, Caroline County, King George County, Spotsylvania County, and Stafford) is Right Worshipful Robert O. Peatross, first worshipful master of Kilwinning Crosse Lodge No. 237 in 1882 and first District Deputy Grand Master of the 8th Masonic District in 1894. He would serve as DDGM several times in the coming years1,4. 2) Hill, Gilbert. “James Monroe: Mason, Soldier, Statesman – Part II.” James Monroe: Mason, Soldier, Statesman – Part II. Accessed April 2, 2015. http://www.knightstemplar.org/KnightTemplar/articles/20080216.htm. 4) Fall, Ralph Emmett. Hidden Village, Port Royal, Virginia, 1744-1981. Port Royal, Virginia: R.E. Fall, 1982.